In addition to my previous post about the ADXL335 accelerometer, I’ve now added some basic calibration! (CurrentVal – MinVal)/(MaxVal – MinVal). If you think about it, this is logical. If the CurrentVal is equal to the MaxVal ever read, the output will be 1 as (MaxVal-MinVal)/(MaxVal-MinVal) has to be equal to 1 as the denominator and numerator are equal. On the other hand, if the CurrentVal is equal to the MinVal, the output will be zero as (MinVal-MinVal) = 0, and 0 divided by anything is 0! This therefore normalizes the values given. One needs to remember however that when collecting the data on the minimum and maximum values, moving the accelerometer too fast will produce erroneous results. If the accelerometer is moved at 3g in one direction, the maximum read value for that direction will be larger than what would naturally be produced by gravity itself! This method is only for a quick normalization of values and much more complex methods are available for good calibration of your accelerometer (See: http://goo.gl/ynP6UV). Bare in mind also, in my simple example, the microcontroller is forever collecting data on the minimum and maximum values! An additional piece of code could be added so that the microcontroller only collects data when a button is pressed or in a defined time period. 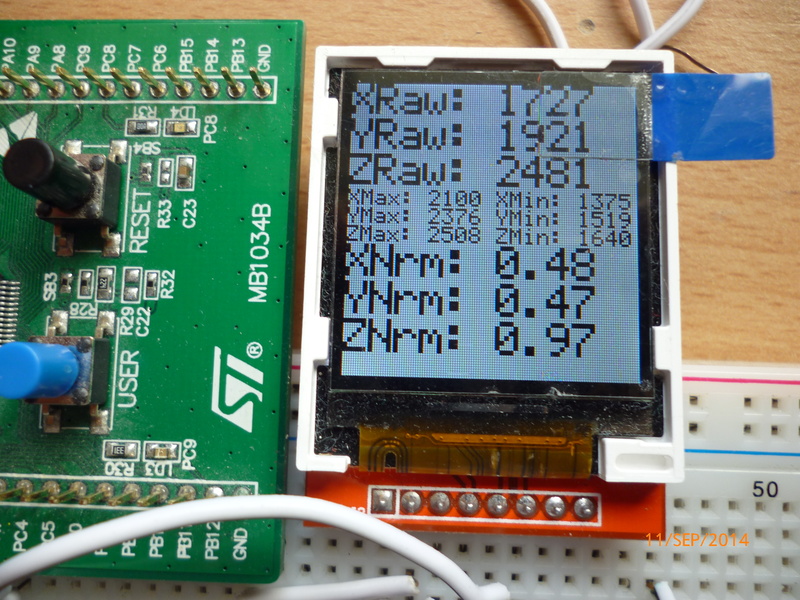 Displaying the minimum, maximum, raw and normalized values from the accelerometer reads! The newly updated code can be found at my github!